It is an Important Ingredient in Middle Eastern Cuisine and Recipes Such as Hummus. 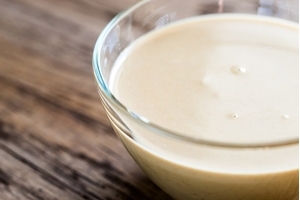 Tahini Can Be Used as Salad Spread or Mixed With a Variety of Seasoning Such as Garlic and Onion or Cayenne Pepper for a Tasty Dip or Salad Dressing. Tahini is Compounded Well to Achieve an Even Texture Throughout. Stir Well Before Use.